A “bean bag chair” will surely turn you into a couch potato with its comfortability and the way your body sinks in into it. A lot of brands such as Muji, SofSac, and some homemade sellers have different bean bags available but the beads inside and the cover’s materials will change the way it feels when you sit on them, and for sure a lot are confused on what to look out for when choosing a bean bag. We will introduce to you the bean bags that are available on Lazada and Shopee and compare their features, and show them in rank order. A wide variety of products not only for adults but also for babies and kids are introduced! Hope you can find the best item that would snuggle you and turn you into a couch potato! Before we introduce to you the top items, let us explain first the things to keep in mind when choosing. A bean bag chair has beads inside them, instead of the traditional foams. The most popular aspect of a bean bag is how it snuggles you when you sit on it, and this feel is dependent on the beads size. If you want something that will let your body sink in deeper, micro beads with less than 1mm in size will be best. If you prefer something that is a bit harder, choose products with more than 1mm bean size. Choose Size Based on Usage: Sleeping or Sitting? A lot of bean bag chairs are available in different sizes, so try to ask yourself first “Do I want to lie down on it or just sit on it?”. If you plan on pairing it with a coffee table, you would want something that is about 50 cm long to support your lower back fully, and be able to sit comfortably. If you plan to lie down on it, choose something longer than 60 cm to support your back and neck. Though a lot of users had a plan of just sitting in it before their purchases, but eventually gave in and lied down due to its ultimate comfort. It might be safer to choose a bigger one after all. To enjoy bean bags to the fullest, it is important to check the cover too. A cover that is stretchable can be softer on your skin. They are smoother and you can enjoy the wiggling beads underneath the cover that snuggles around you when you sit. A perfect combination to turn you into a total couch potato. On the other hand, choosing a hard cover like leather will make it a great part of your interior. The hard cover will make the bean bag more resistant to pressure, for a more stable feel when you sit. This will all depend on one’s taste, so try to go to an interior shop and try touching or feeling different types of covers or linens. Surprisingly, there are a lot of bean bag shapes available nowadays. The most common shape is the round one, but there are also products that look like a stool, or those with little backrest, and some are very uniquely shaped. There are a lot of ways to enjoy bean bags like sitting, lying down, using as a pillow, or sleeping in it like a baby, so the shape that you want might change too depending on your goal. You can check the scenario photos when you’re purchasing online, make sure you check them out before your purchase. A removable cover will let you wash them when they get dirty, making them easier to maintain. You can wash them, or replace the cover with new ones. Also, choosing products with refillable beads will come in handy, as the beads will decrease through the years no matter what happens. You can bring back the snuggling feel of a brand new bean bag, just by refilling the beads. How great is that? We will now introduce to you the top 10 items that we found online while keeping in mind the buying guide that we discussed earlier. I hope you can find the perfect item for you! Add Color to Your Room with One of These! The bean bags from this seller comes with a cover that has very cute and colorful prints on them. The cover is also anti-static and highly breathable for a higher level of comfort whenever you sit on it. We highly recommend this product to those who are looking for a fashionable way to relax and enjoy your leisure time. The covers are machine washable, for easier maintenance too. This product uses synthetic German leather for durability and is easier to keep clean and maintain as it can withstand water or juice spills as you can just wipe them away. You can also refill its beads, and the beads can be bought in Divisoria at a very affordable price. This has 11 other colors to match every room in your house, from the living room to the kids’ room to master’s bedroom. You can change the ambiance just by choosing a different color. A basic bean bag chair to meet your needs at an affordable price. This product comes with a handle, perfect for those who like to change their hang out a place from time to time. You can bring it to your room, the living room, the terrace for fresh air, etc. This comes in three different colors that you can choose from, to match your interiors best. It can also be a great gift for your nephews and nieces or children who love football. This bean bag chair is baby friendly because of a lot of factors. 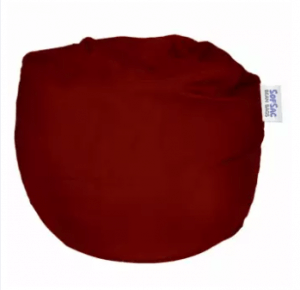 First is its velvet material bean bag cover that is very gentle, even on baby’s sensitive skin. The cover is machine washable as well and easy to clean. Second is the shape, with its angle and sturdy backrest, your baby will surely be able to sit comfortably on it. Its light slope can be great for short naps too, but make sure your kid won’t get hurt when he/she falls or rolls down. There is also a fur ball at the top of it, that can also entertain your kids! The camouflage print can be a good accent to your living room or your room, as it won’t stand out too much but still is not too boring looking. A perfect item if you are looking for something that won’t overpower your other furniture but is still fashionable enough. The zipper is double lined to make sure there are no leaks, to prevent shrinking of the product. This can also be a good gift to your military friend, or anyone who loves playing airsoft. Yes, a bigger sized bean bag will be more flexible and is more advisable, unless you have a limited space in your house. If space is one of your problems, then this bean bag is for you! It is compact enough to fit in smaller spaces, yet sturdy enough to support adults. It has a basic machine washable cover, with a lot of colors to choose from. With its basic circular shape, it will be easier for you to find a replacement cover too when needed. This product has a backrest that is relatively higher than other bean bags, with a cute pair of ears that you can’t resist! If you want a product that is cute but not too cutie patootie that it might not match with the rest of the room, then this might be the one for you. You cannot lie on this bean bag chair because of its size and shape. However, it has a child-safe zipper, so you won’t need to worry about your kids scratching their skin on the zipper or having their hair tangled. This product is a made to order bean bag, meaning you can choose a shape, the fabric used for the cover, and the color. We chose one of the most uniquely shaped bean bag, which is this long sofa-like bean bag that you can lie on, or sit on with your family or friends, up to 3 adults. It can be a great substitute for a traditional couch if you are aiming for a unique and super comfy looking interiors. It can also be a great couch for gaming as it will allow you to change position from time to time with its big space. How was the top 10 bean bags ranking? They may look the same, but the bead size and the cover material will change the way it fits your body, we recommend to continue looking for the PERFECT ONE for you. Hope you can find the product that will turn you into a total couch potato!